Staff Selection Commission has made an important change related to the Age criteria. Earlier, it was mentioned that the age limit will be reckoned as on 1.8.2016. However, On the request received from a large number of students, this date has been changed to 1.1.2016. 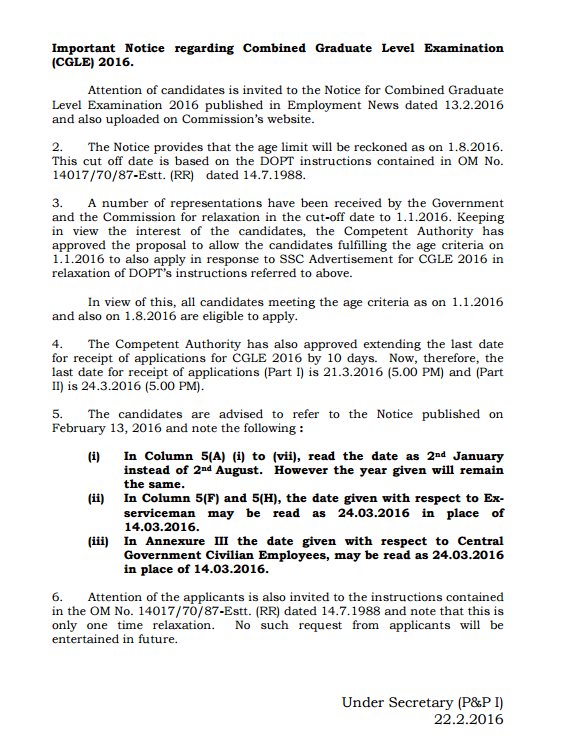 All candidates meeting the age criteria as on 1.1.2016 and also on 1.8.2016 are eligible to apply. New last date for receipt of applications (Part I) is 21.3.2016 (5.00 PM) and (Part II) is 24.3.2016 (5.00 PM). It is also mentioned that this is only one time relaxation.